This pumpkin bread with chocolate chips is moist, tender and filled with warm spices. Perfect for fall & impossible to resist! 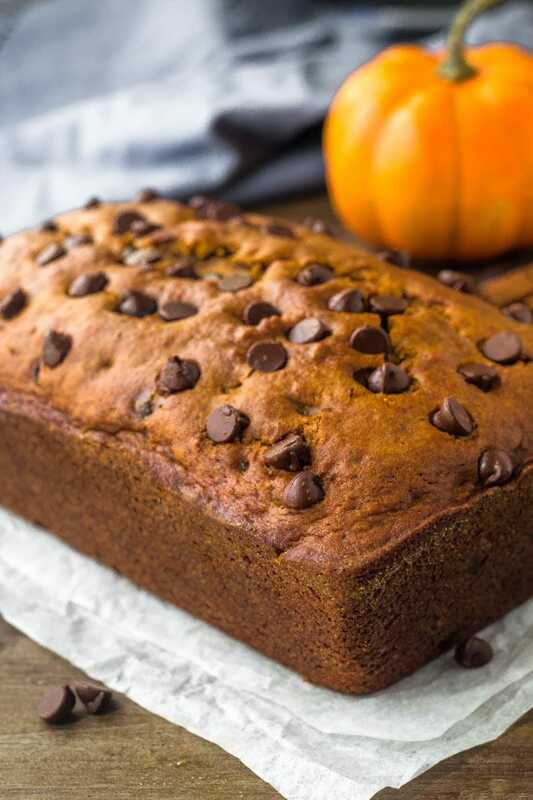 If you’re looking for an easy, delicious pumpkin recipe for fall – then this pumpkin bread with chocolate chips is exactly what you’re looking for. 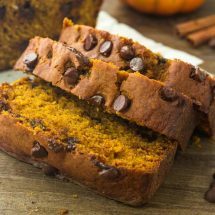 It’s soft, tender, extra-moist and packed with flavor thanks to the pumpkin and chocolate chips. For the longest time, I actually wasn’t too sure about the combination of pumpkin and chocolate. I had seen so many pumpkin chocolate recipes on Pinterest that seemed super popular, but I wondered if it would be a bit of a flavor overkill with both flavors combined. Delicious on their own? Absolutely. But pumpkin AND chocolate together? I wasn’t quite sure. But my curiosity got the better of me and I had to try it. Let’s just say that I wish I hadn’t waited so long because pumpkin and chocolate are so delicious together. 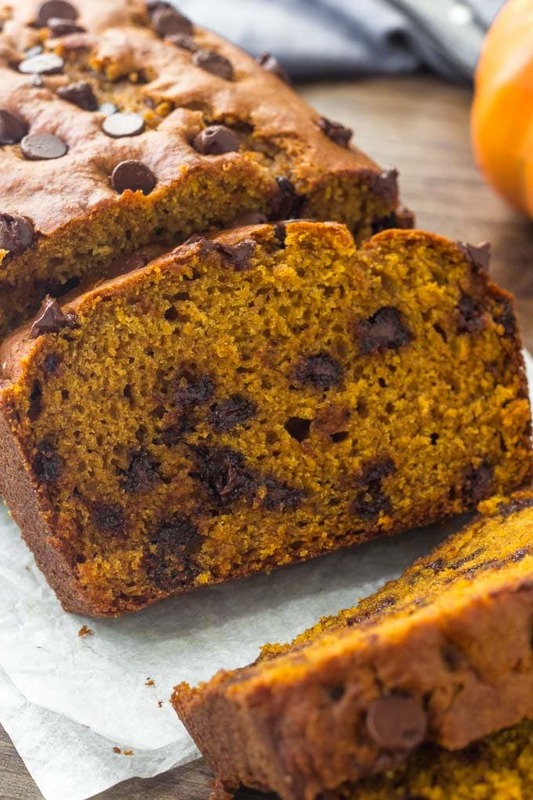 And when you make this pumpkin bread with chocolate chips you’re in for one delicious treat. This pumpkin bread recipe is ultra moist and tender because we’re using oil, 2 eggs and pure pumpkin (not pumpkin pie filling). Then the bread is filled with so much flavor because of the brown sugar, spices, pumpkin, and chocolate chips. The recipe super easy and doesn’t even require an electric mixer. To get started, first we whisk together the dry ingredients. Then in a large bowl whisk together the oil, sugars, eggs and vanilla extract. The pumpkin gets mixed into the wet ingredients, then gently fold the dry ingredients into the bowl followed by the chocolate chips. Make sure you bake it in a 9×5 inch loaf pan instead of an 8-inch loaf pan, otherwise it can overflow. I definitely recommend using a light-colored loaf pan if possible, because it helps prevent burning on the edges. It’ll bake for about 45-55 minutes, and fill your kitchen with the most delicious pumpkin spice smell. 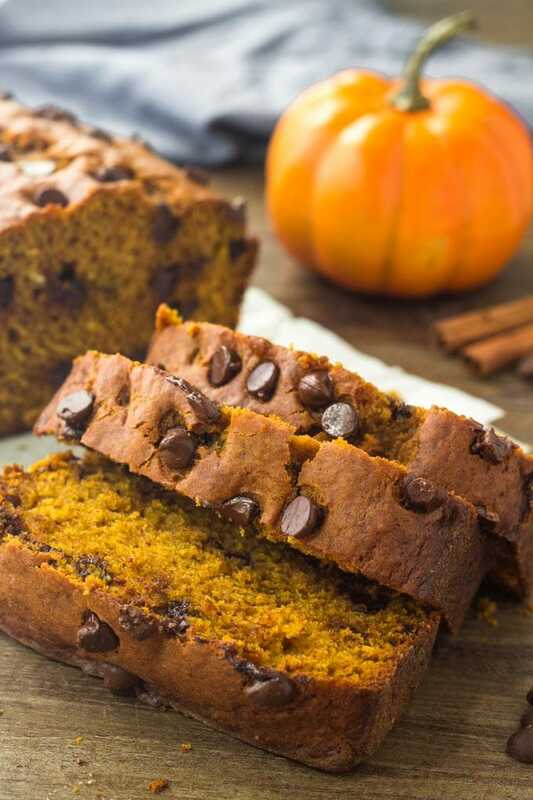 This pumpkin bread with chocolate chips is such a delicious fall recipe, and whether you’ve tried pumpkin and chocolate together before or not, I definitely recommend trying this pumpkin loaf recipe! For more pumpkin recipes, try these other favorites! 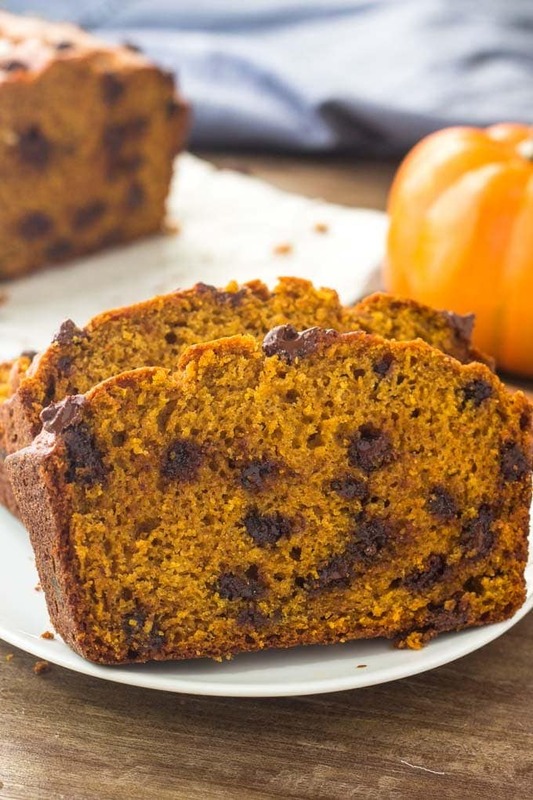 This pumpkin bread with chocolate chips is moist, tender and filled with warm spices. Perfect for fall & impossible to resist. Preheat the oven to 350F degrees. Grease & flour the bottom and sides of a 9x5 inch loaf pan. In a large bowl whisk together the oil and sugars until smooth. Then whisk in the eggs and vanilla extract. Fold the flour mixture into the pumpkin mixture, then gently fold in the chocolate chips. I reserve about 1 tablespoon for sprinkling on top. Pour the batter into the prepared pan, optionally sprinkle the top with a few more chocolate chips. Bake for 45-55 minutes or until an inserted toothpick comes out clean. *If you don't have pumpkin pie spice, feel free to use 1 1/2 teaspoons cinnamon instead. Looks so delicious and moist! I love pumpkin bread!